Two priests, Sabinus and Crescens, for whom Gregory had done much good, could not at all tolerate Gregory's virtuousness. For such is the nature of vice, that it cannot tolerate virtue. Consequently, Sabinus and Crescens found a notorious prostitute and bribed her to malign Gregory by saying that he had had immoral relations with her. So it was that when Gregory was in church, the woman crept into his bedroom, and just as Gregory came out of church with the people, she emerged from his room. The two priests began to revile Gregory as a libertine. However, Gregory was composed and prepared for every suffering. They placed the holy bishop under guard. The people attempted to defend their bishop, but were unsuccessful. At the trial the harlot gave false testimony against Gregory. Just as she pronounced the words of slander, she went into a fit of frenzied rage. The judges accused the Saint of sorcery. Gregory was sent for judgment to the Pope in Rome together with a report about his "crimes." The Pope, after reading the charges, did not want to see the accused, and gave orders to remand him to prison. The Saint endured his humiliation humbly, dwelling in constant prayer. His prayerful effort and wonderworking gifts quickly became known throughout the city and the surrounding region. Pious Romans began to gather at the prison, whom the imprisoned Saint taught about the righteous life, and he implored the Lord to heal the sick. After two and a half years, without a trial or a verdict, the clairvoyant Elder Mark, who had known Gregory since youth, came to the Pope. 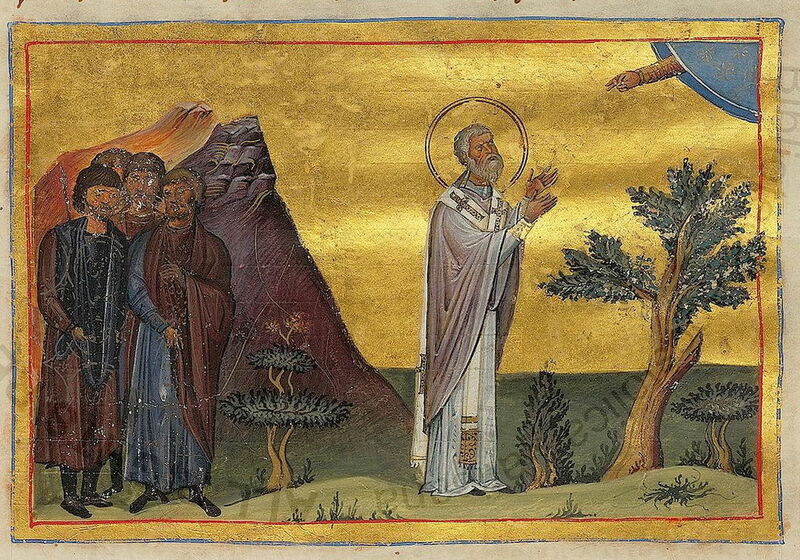 The Elder did not believe the charges and he persuaded the Pope to convene a synod to decide Gregory's case. At the invitation of the Pope, many clergy from the city of Agrigentum came to the synod, together with all those making accusations against the Saint, including the harlot. From Constantinople three bishops and the imperial dignitary Marcian came to Rome. Along the way Marcian had fallen grievously ill. On the advice of many people who had received healing through the prayers of Gregory, servants carried the dying man to the prison where the wonderworking Saint languished. Through the prayers of Saint Gregory the Lord granted healing to Marcian. At the synod the slanderers attempted to renew their accusations, and as their chief proof they presented the deranged harlot to the judge, declaring that Gregory had bewitched her. But the Saint prayed over her and cast out the devil. The woman came to her senses and told the synod the whole truth. Through her tears, she confessed that she had been bribed to malign the man of God, and that immediately after she had committed the slander, the evil spirit had entered her and held her in its power. Sabinus and Crescens, along with the other maligners - more than a hundred in number - found their faces suddenly turned as black as coal (which could also be seen in their descendants for many generations), and they were punished with exile. Marcian wanted to execute them, but Gregory implored forgiveness for them. Gregory returned in honor to his own cathedral, and was received with great exultation by his people, and there he worked greater wonders than before. Surrounded by the love of his flock, he guided the Church for many years until he attained deep old age, and he reposed in peace in 590.